The LT model air shower is for 4 or more person occupancy per cycle. It is compromised of 2 or more modules. The size ranges from 72” to 240” long. The standard widths are 64”” and 72””. 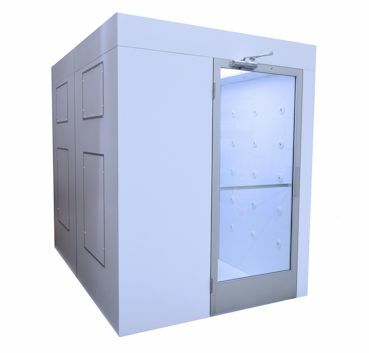 Custom size units are available for the LT model up to 96” width and a maximum length of 360” (30 feet). All the LT models have (1) 5HP direct drive blower and (1) HEPA filter per module. The TN model comes with all our standard features. The Low Profile Tunnel Air Shower is often used where there are more than 25 people per hour that need to use the Air Shower.